Ages ago, I reviewed The Ides of March and felt that it was quite average for a political thriller, especially compared to films such as Wag the Dog and Primary Colors. Since, I’ve discussed the film and read other reviews, and it seems that most people thought it was a much better film that I did. I do want to revisit it, however I wanted to see the others first for some comparison. 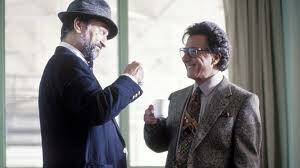 Wag the Dog tells the story of a Conrad Brean (Robert De Niro) and Winifred Ames (Anne Heche) who are working in the last fortnight before a presidential election to bury the story of a sexual encounter between the President and a young girl. They bring in Hollywood producer Stanley Motss (Dustin Hoffman) to produce the appearance of a war with Albania, along with victims, heroes, the whole kit-and-kaboodle. It’s fabulous. It totally plays into the idea of a massive conspiracy. It couldn’t be done now; with the internet and wikileaks, it would be very easy to disprove. In fact, it couldn’t have been done then. There is no way the media would just go along with the stuff that is being fed to it – regardless of how cleverly the leaks appear are done. But what the films shows is how it could almost be possible – and if it could happen, this is how it would go. It’s fabulous, so funny. Wonderful cast, great script. We even got a bit of Woody Harrelson, Kirsten Dunst, William H Macy, Dennis Leary and Willie Nelson. Perfect.